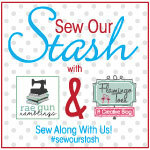 Jolanda's Sewing Corner: Better Late than Never?? Oh dear I am late with the MAGAM challenge AGAIN!!!! This jacket was so hard. There wasn't a lot in the way of instructions and what there was I didn't understand. So I kind of muddled through it, but got there in the end. The sleeves were on and off several times, as the easing was so difficult I just couldn't get it flat; so they do have a little bit of gathering that shows. I really didn't enjoy making it at all and am so glad its finally finished. I'm not that pleased with the result but will wear it with my '50s style' dresses. This jacket is being modelled by my new mannequin 'Ella'. She was a gift from my neighbour! and is quite old. I think she is from the 1960's but isn't quite complete as she needs some bits for her stand. Now I have to think of what to make for February! It will have to be something fairly easy and quick for my sanity!! I will have a think over the next couple of days and be back with you soon.